The solar powered security camera use the solar panel to get power and does not require electric source or cabling. You can use the natural resource to charge and run the camera without any electric source or without any subscription charge. Nowadays, security camera is installed everywhere where it is used to deter crime, monitor activities, gather evidence and maintain records. surveillance camera is used in places like airport, road, residential places, shop, hospital, and more to maintain record. Pro Tip:Having a solar powered security system is easy to install and it does not require local power supply. It is environment friendly and keeps your place secure. Solar surveillance camera is easy to install where there is no need to drill holes and cables required for it. It is a cost effective security option and you can also easily change it to another location. You can also place it in indoor and outdoor like front door, backyard, nursery, temporary construction site and more. The solar powered camera can also be powered by rechargeable batteries at night when the sunlight is not available. You also get amazing night vision and it also lasts long. By using solar CCTV camera, you can save a huge amount of electricity and the footage can be saved in SD card. It is a solar powered camera and 1 sunny day enough for the camera to work up to 7 days without power or internet outage. The solar camera does facial recognition where you get check-in notification with familiar face. You can also get crystal clear HD real time video streaming and recording from your mobile device. It comes with free cloud storage where you can backup and review videos with our cloud storage. You can also check what happened in the previous 7 days as well as there is motion detection and instant alerts. With this feature, you get instant notification on your mobile device for events triggered by motion detection. 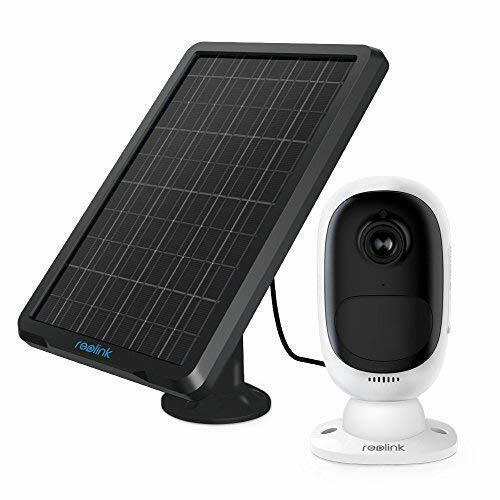 The best solar camera to keep an eye on your family and also monitor your pet through live streaming. It is easy to set up and comes with two way audio. It is the best solar powered wireless security camera where you can use it for indoor and outdoor which comes with rechargeable battery. This camera does not require drilling or wiring for installing the camera. The security comes with 1920*1080 resolution to get crystal clear picture and also comes with starlight image sensor which can see upto 36 ft night vision. 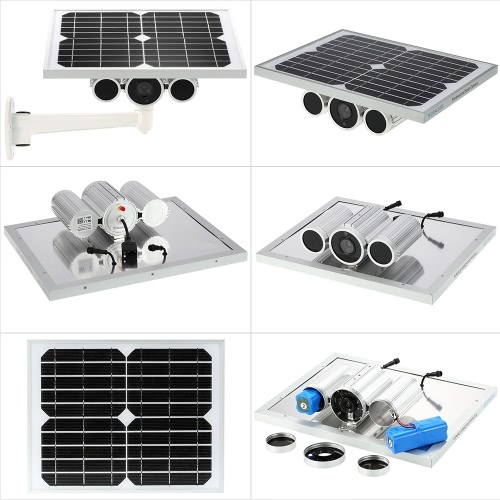 The solar powered outdoor security camera comes with micro USB connector on the battery and the wifi camera can be charged by universal 5V 2A phone adapter. This helps you to save money on the new battery. The solar security camera comes with Built-in micro SD card slot and curity ip camera can keep recording files locally in SD card. It supports up to 64 GB and you can do easy playback with the app with no subscription charges. This outdoor security camera does not require a base station and the wifi ip camera can work with 2.4G wifi router directly. It is a top solar powered Wi-Fi IP camera to get a clear picture quality and also get night vision distance for 80 meters. Funxwe solar security camera is a water-proof which has lens of 6 mm, 3x digital zoom, aluminium alloy metal shell and more. The thin solar panel supplies power to the camera where there is built-in 2 pcs 11600mAh Lithium batteries and the battery life is for 5 years. You also get standby time for 2 days after it is fully charged and it stores power when the sunshine is up to o 33°C. The solar powered security system supports 2.4 GHz and it uses Starlight sensor at night wit no IR LED. When it is put in complete dark where the night vision may be invalid where you can add IR LED light to resolve it. You can also monitor the area through app from mobile. 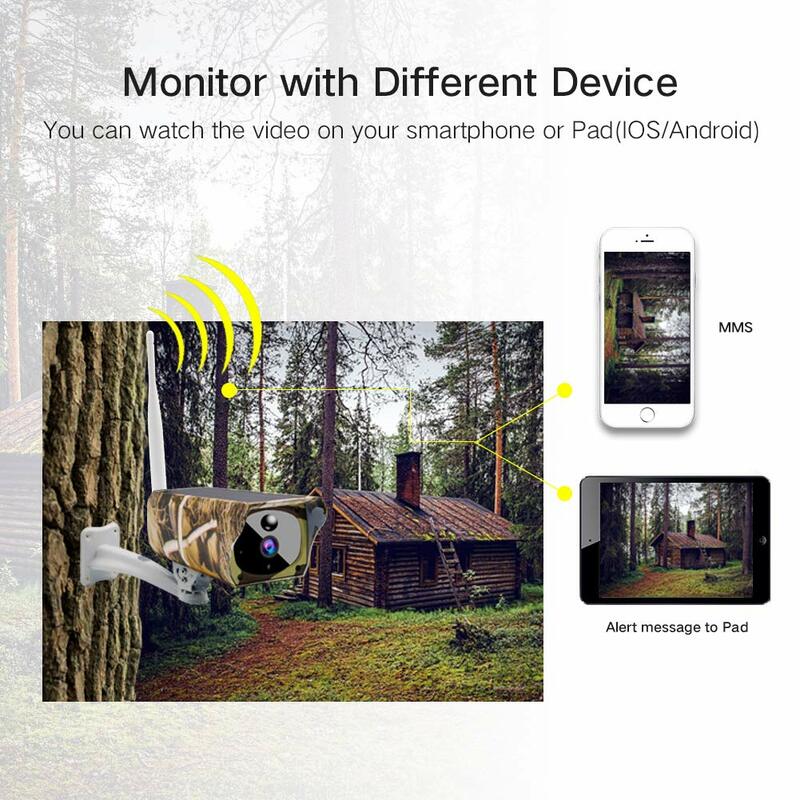 It has peer to peer connect to cellphone directly and there is also motion detection that can send Email photo alert, push alert notification, snapshot or video recording to FTP. It comes with two year free replacement of spare parts warranty that excludes battery. It is the best outdoor solar powered surveillance camera which has long battery life and strong night visibility. You can get best protection for the residential and commercial properties. When the battery is fully charged it can stay up for 2 day and this can be useful when you have cloudy days. There is also motion alert when movement triggers the camera and you receive a automatic email alert that includes snapshot of the captured activity. It also produces clear night vision images up to 100 meter. You can get two way power supply for the camera. You can get p2p cloud function, peer to peer connection and there is no need for port mapping. The user’s can monitor the area from anywhere and anytime by using iOS or Android app. You can get the crystal clear image and this is the best camera to monitor your place. 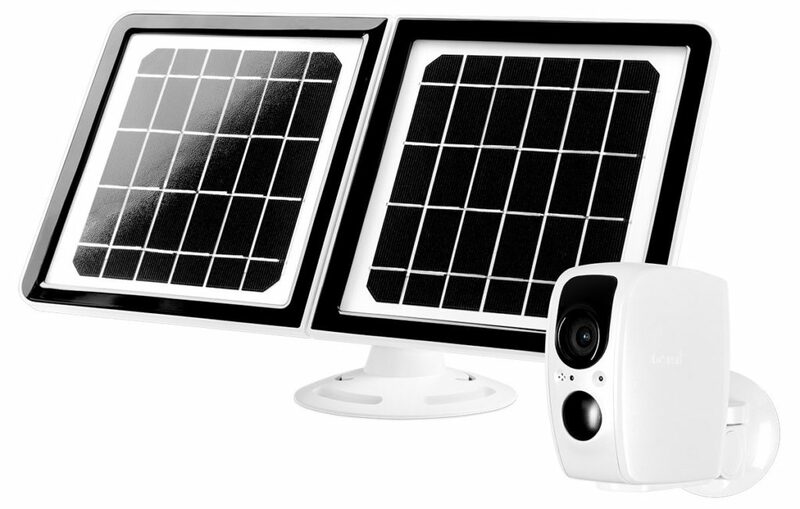 This is one of the best solar powered outdoor camera which has all required feature for monitoring the place. You can use it anywhere outside the house and it is well-constructed. This is a solar powered wireless outdoor surveillance camera to protect your home and family member. MAXSA solar camera can monitor day and night time activities where there is motion activated camera that records all activities. It is capable of capturing all movement within 110 Degree range during day as well as movement 15 feet away at night with floodlight. There is 16 GB Micro SD card that holds up to 4 hour of time and date-stamped video. It has 12 SMT LEDs that produce over 878 lumens and comes with 3.7v 4.4Ah rechargeable lithium-ion battery pack. The solar powered security camera works on all weather condition and all the captured video are stored in SD card. It records up to 5 hour of video and access videos by simply plugging the camera into your computer. MAXSA Solar Powered camera is a IP-44 weatherproof rating where the light will work in any climate. 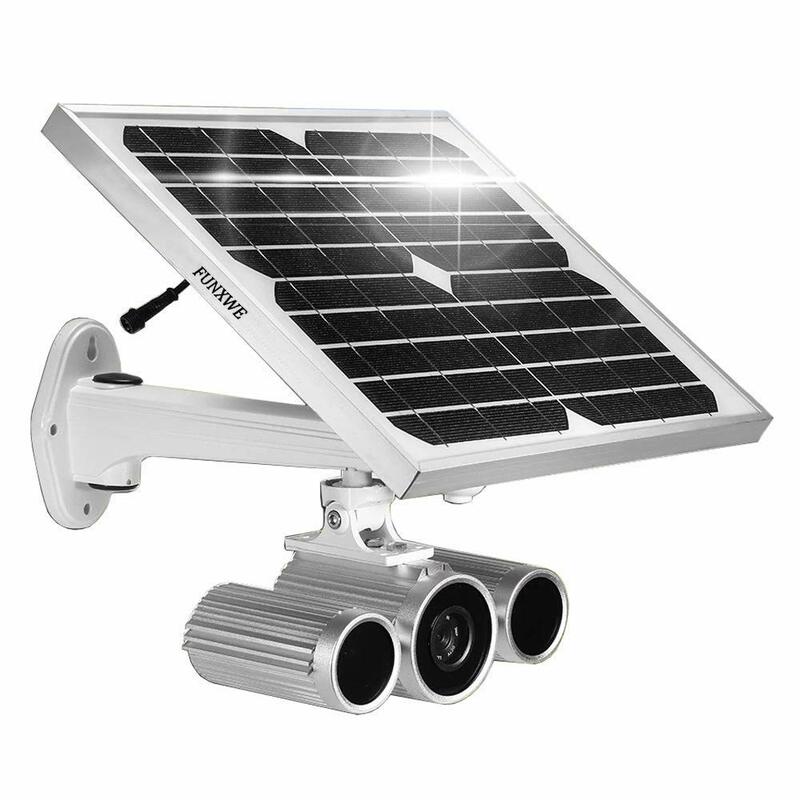 You can position the solar panel to get maximum sunlight and this outdoor camera can be installed in places like driveways, parking lots, entrances , farms , parks and more. It is a top solar security camera which is easy to use anywhere and access. It is a wire-free solar powered wireless security camera and has a built in 4000mah battery and self sustained solar panel. 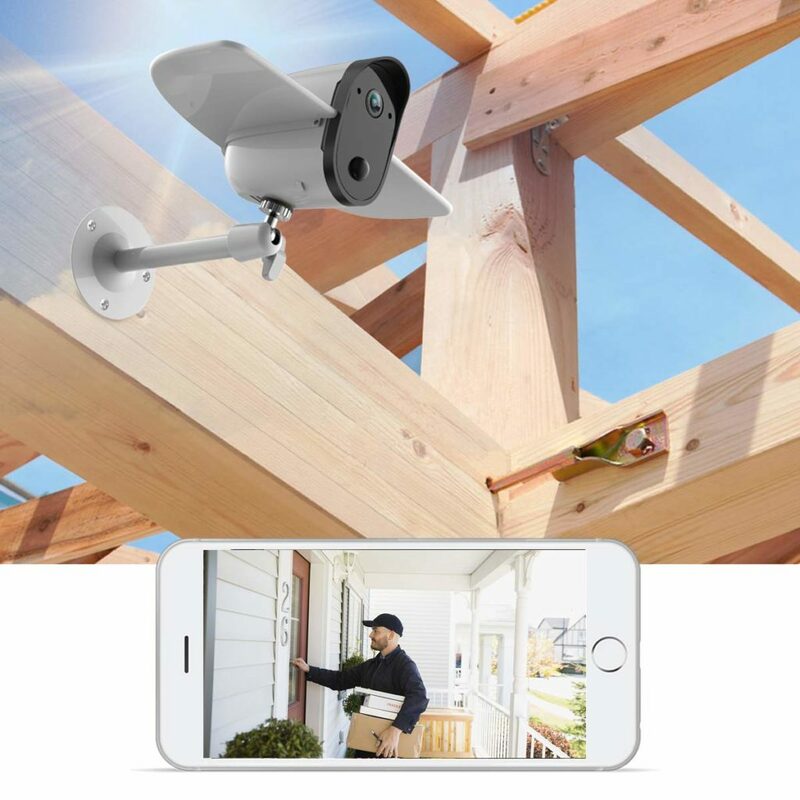 The best solar security camera comes with IP66 WEATHERPROOF with Soliom S60 material which is a special plastic material to withstand high pressure. The Soliom S60 has accurate motion detection sensor which two ways of motion detection technology to reduce false alert and has 0.7 second amazing fast trigger speed. It sends alert to your smartphone when the motion is triggered and has 1080p full HD day time video quality with refined five layer of glass. You can also choose the best LED for night vision and has max 33-49 ft night vision distance. All these feature help you to have a better indoor and outdoor security. There is also way way talk with built in microphone and speaker that lets you to communicate with your elder, kids, pets and other. You can also get a larger angle which records video with FOV 160° angle and PIR 110°. Apart from other feature, you can also have unlimited storage saving and also remotely monitor your home from anywhere at anytime. This product is easy to install and select a area direct sunlight for 1 to 3 hour(min). The Reolink Argus Pro is a wireless security camera which comes with rechargeable battery and solar powered panel. It is easy to install and there is no need to make hole in the camera. 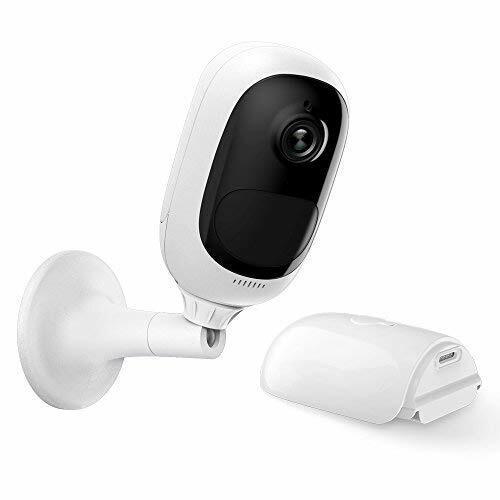 You can install the camera in indoor and outdoor as well as it comes with USB connector on the battery where the Wi-Fi camera can be charged with 5V 2A phone adapter and reolink solar panel. The solar powered outdoor wireless surveillance camera comes with 1080p and has 36ft night vision to get crystal clear image. There is also built SD card and the security ip camera records file locally in the SD card which can support up to 64 GB. You can also have playback of the videos from reolink app with no subscription fees. Reolink Argus pro is a top security camera which has wide angle view to cover more and it is IP65 weatherproof which works on all weather condition. It also comes with highly sensitive PIR motion for no false alarm where you can get email alert, sound alarm and push notification. There is also two way audio with built-in microphone and audio where you can talk with elder, friends and other. In addition, you can save the recording in cloud and local SD card. The camera is a solar and battery powered which comes in a camouflage design and there is no wiring required for it. It comes with advanced infrared light, night vision range from 10 to 15m and protects your home at night. The top solar security camera comes with IP65 Waterproof and Dust Performance where you need to not worry about it during rainy days. You can also insert SD card to watch playback of the video and when the memory cards storage capacity runs out, it overwrites the oldest video files. It comes with built Hot-spot where you can watch it in your home directly without Wi-Fi. There is motion detection where you can turn on smart detection to detect moving objects and get alerts to your mobile. Solar powered security system has two way audio where you can listen and talk to your family, friends and dogs. It has 10 meter PIR human body sensing and it does recording when the object moves. 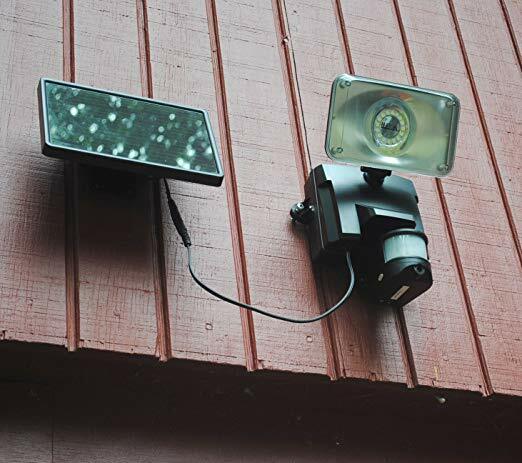 This outdoor wireless security camera is environment friendly with green energy saving. The main advantages of this security camera it works with battery as well as with solar. It requires a average of two hour direct sunshine or 60 hours per month. Buyers can choose the solar powered security camera according to the requirement and having 1080p resolution helps you to have a crystal clear image quality. You can also opt for built-in SD card and cloud storage for playback. A home security system is without a doubt one of the most important assets for guaranteeing safety within the household. In this article I am going to take a little look at a number of products which are almost essential to running a proper home security system. If you have all five of these components in your house, or at least a few of them, both you and your family will feel much safer. This is without a doubt one of the most important parts of the home security system. It is your central ‘hub’, and yet many security systems don’t include this. In times of emergency wouldn’t it be great to have somebody on hand to help you out? Maybe your alarm system is triggering whilst you are away? A control panel will not only allow you to control the whole security system but to also provide a direct link to people that can help you out when you are in need. This is again another important component in your home security system. Having one of these I place will most of the time deter ‘would be criminals’ and if someone does decide to take the risk the alarms will trigger which will ensure that people who can help out get there in double quick time. This is going to minimize the amount of damage that can be caused by the criminal, whether it is vandalism or the removal of property. If you have a larger property then it may be worth investing in CCTV Cameras to keep an eye on the property. This will ensure that you can keep an eye on all areas of your property, or if you are out it can record people that approach the property, criminal or otherwise. This system can also act as a deterrent most of the time After all, who would commit a crime if they knew that they were going to be recorded? The biggest danger in the home isn’t actually criminals but fires and carbon monoxide poisoning. If you don’t have early warning systems in place like this then your family is in danger. After all, carbon monoxide is known as the ‘silent killer’. If you find that you are overwhelmed by smoke then again your life is being placed at considerable risk. Therefore this is one of the most essential pieces of equipment to add to your home security system. Motion Sensors can be used to either trigger an alarm or a light. This will let you know if anybody is approaching your property. It also provides you with aid if you are coming home late at night. Make sure that you purchase top quality motion sensors however in order to ensure that they won’t be triggered by something small, like an animal. This is just a quick highlight of the various home security systems that you have installed in your home. I suggest that you talk with your provider to find what the best is going to be for your needs. Home Security is now more popular than ever. Not only for the protection of property but also for the protection of your family. More people are now realizing just how dangerous this world is and are investing in home security systems. However, with a plethora of different systems out there, how do you choose the best one for your needs? Let’s take a little look. One of the first things that you are going to want to consider is the price. Whilst we all wish we could through unlimited money at home security, sadly this isn’t something that can be done with ease. Instead we will have to set ourselves a budget and stick to it. You may not get everything that you want for your money but it will be a start. Take a browse about to get a general idea on the prices for different home security systems. A number of home security companies will offer your basic home security system for free as long as you sign up to their monitoring service. Of course, the monitoring service is something that you may want to look into in the future, so it is certainly worth comparing these systems. Once you have identified your home security systems that are within your budget you will want to consider what you are actually getting for your money. Is it just a simple alarm system, or is it something more extravagant, for example including CCTV systems or Fire Alarms? One tip I can offer here is to walk around your home and identify all windows that need to be secured. You will also need to consider the size of your home. This means would you prefer wireless alarms or wired? Of course the first option is more expensive, but it is the only viable solution if you live in a large household. You will also need to consider whether your home security system includes home monitoring services or not. This is an additional cost of course, but the monitoring service will more than pay for itself if somebody attempts to commit a crime against your property whilst you are outside of your house. You will probably need to factor the monitoring service into your budgets. You will also want to take a look at the various control panels offered. This means considering how the alarm systems are turned on and off, and perhaps a bit of consideration surrounding whether you are able to use the control panel easily. Of course, the most important thing to consider when searching for home security systems is by consulting reviews. There are plenty out there on the plethora of manufacturers and service providers. Make sure you read up on them! That way you won’t be burned by choosing a less than fantastic service provider. Hopefully this has given you a brief idea on how you can compare home security systems. Of course, it isn’t a complete guide, but it should certainly set you on your way towards choosing the right home security system for your family. Remember, always consult reviews! Even though it is one of the most important decisions you can make for your family and home, very few people are actually clued about what the most effective security system is going to be for their home. That is part of the reason why I have written this guide, if you follow a few of the ideas in this guide then you will find that choosing the most effective system for your security needs is going to be a breeze. When you start looking for a home security system you will need to consider whether you want a hard-wired alarm or a wireless alarm system. The benefit of a hard-wired system is that it is incredibly cheap. However, it is connected to the phone line, and thus if the land line is exposed they are not recommended as a burglar could quite easily cut the system. A wireless system is portable and thus even if you move home you can keep the alarm system. You will also need to consider the type of control panel that you have installed, you may think this is an easy decision, but really isn’t. For example, more sophisticated alarm systems will show you if entrance points to your household are open, and thus stop you from locking the system. Other control panels will have buttons installed which will allow you to contact the emergency services quickly. Some also have two way calling. If you are hard of hearing then you may want an alarm system which offers voice technology, that way you know what you are doing. Some systems are so sophisticated nowadays that you can even control them form your smartphone away from the house! You may also want to choose a number of add-ons when having your home security system installed. This includes sensors for your doors and windows which detect when they are undone. Motion sensors should be standard anyway. If you have pets then you will want to ensure that the company supplies ‘pet friendly motion sensors’ which ensures that it isn’t set off by your fury friends. You may also want to consider other types of sensors that could assist in your home security, for example windows which detect glass breaking (something which window sensors don’t do) as well as sensors for detecting smoke and heat, as well as carbon monoxide detectors. All of these combined should make for pretty effective home security. If you have the budget to play around with, and a particularly large property then you may also want to invest in CCTV Cameras and similar monitoring systems. This will provide you with the best protection for your property. Hopefully this article has been of some use to you. Remember, before choosing your home security company, always check online for reviews about the systems to see if they are ‘up to scratch’. Remember, don’t buy a poor quality system, you will end up paying for it in the long run! Do I need home security? The short answer to that is yes you do. However I do have a small inkling that you are after a slightly more drawn out answer to swing you ever so slightly further towards the best decision that you are probably ever going to make for your home, and for your family. So let’s take a little look at why exactly you need home security. One of the main reasons for opting for Home Security is because it helps protect your family. Imagine this, someone breaks into your home, they intend to steal something but instead you are at home. They are probably going to get scared, and you are to. Wouldn’t it be much easier to press a panic button rather than call 911? This is going to ensure as little harm is going to come to you as possible. Another way in which home security can protect your family is by providing ‘smoke detection systems’. Did you know that smoke is actually the main culprit for deaths during a fire? With a smoke detection system in place you will get early warning of the fire, and as a result improve your chances of getting out of the property quickly. Preventing burglaries however is the main reason why people opt to have a home security system installed. Many people who have committed crimes like this in the past have been interviewed and they have expressly stated that they would purposefully avoid a house which has a home security system as it simply isn’t worth the risk. Those homes which do have them installed are protected against opportunity thieves who attempt risks anyway. With a proper home security system, your house will be monitored even when you aren’t at home. As soon as the alarm goes off, your monitoring team will get in touch with the local authorities who will be instantly dispatched to your property. This means that you can be assured that your house is in the best possible hands, even if you aren’t there to look after it. Home Security Systems can also give you peace of mind when you are in your home. Wouldn’t you feel much safer knowing who was knocking at the door or perhaps who is roaming around your property? CCTV Systems and related products will be able to help you out with this. If those benefits were not enough, a home security system will actually bring down the cost of your home insurance. This ultimately means that when you have a home security system installed you could be saving money. As you can see, home security is incredibly important. There are plenty of Home Security companies out there, so why not check a couple of them out and see which services they can provide. Remember, each home is unique and thus will have its own home security requirements, so just talk to a local company and they should be able to help you out. Honestly, with a home security system, both you and your family will feel much safer. Knowing how to prevent a burglary is perhaps one of the most important things you should know when you own and rent a property. In this article I am going to give you a couple of tips that you should put into action as soon as possible. If you use all of these, then the chances of a burglary being committed in your property is significantly reduced. Whenever you leave your home, no matter for how long, ensure that all of the windows and the doors are closed. It doesn’t even matter if you are just ‘popping out’ for a couple of minutes. An opportunistic thief could get in and out of your property in that time. Some people suggest that you install a home security system that ensures that it cannot be ‘set’ until every window and door is locked. These may cost a little, but what happens if you forget to close just one window? You are providing an entry point for someone getting into your home. If you are going to be leaving your house for long periods of time, i.e. going away on vacation then you may wish to consider putting in ‘automatic timer’ switches. These will turn your lights or other electrical equipment on and off at set times. This gives the impression to people outside that someone is in the property, even if there really isn’t. Remember, most burglars will be watching a house for a number of days beforehand to see what your habits are. You don’t want them to notice that the lights haven’t been turned on for a number of days do you? If you are leaving your property for a while then you may want to ask a neighbour to check your property from time to time, and even check your mail for you. This is perhaps one of the biggest signs that a property is unattended. You will also wish to make your property as ‘undesirable’ to burglars as possible. This means leaving nothing of value on display. This of course includes the obvious such as jewellery and money, but it could also include less obvious items such as electrical equipment and children’s toys. Basically, tidy your house up if you are going out, do not leave things on show, most burglars will peer through a window before deciding whether to take a risk or not and break into your property. Don’t forget to clean your yard as well! A number of burglars are opportunistic, and if they notice something such as garden tools or loose bricks then you are giving them a way in which to smash into your property. These reasons are all well and good, but the best way to prevent a burglary is to have a home security system installed. This can help prevent your property no matter where you are. Most burglars will avoid a household which has a home security system installed, and those that do get into your house will be caught out by a 24/7 monitoring system. Hopefully these tips have been of some use to you, and that they help prevent burglary in your home!